Well, I got that “itch” again this spring. No, not poison ivy! 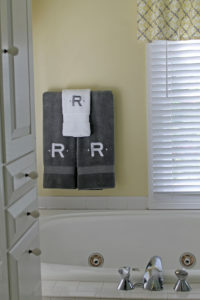 You know the one…that “itch” to refresh a few rooms in our house! 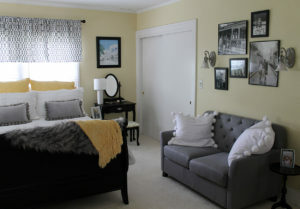 I think it comes from living in the midwest and being cooped up all winter…I just feel the need to make some updates and changes in our home. We’ve had this bedroom furniture for over seventeen years. While I like the style of the pieces, they needed an update. So I talked my husband into painting them black. Not only did he agree to it, he actually did the painting! 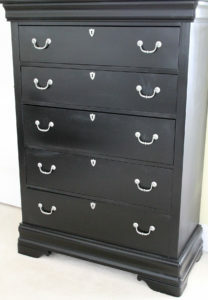 I think he’s gotten used to my “spring itches!” That black paint and the newly painted handles made all the difference. 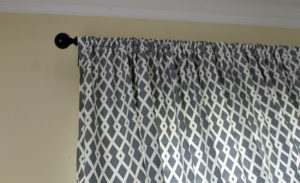 So while he was painting, I was sewing new window treatments for both rooms. 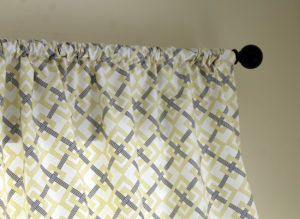 I used a grey geometrical patterned fabric for the bedroom windows, and I decided on a grey and yellow pattern for the bathroom. 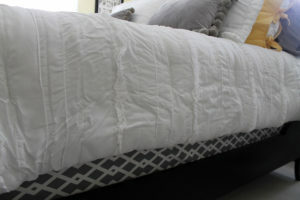 The bedding needed a refresh, as well. 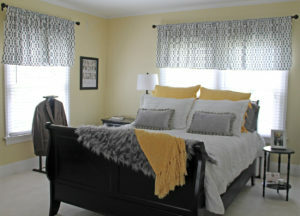 I decided on a simple white comforter, layered with yellow and grey pillows and throws. 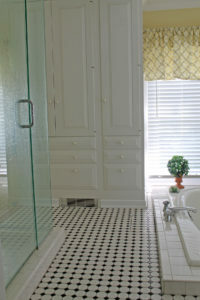 Lots of different textures appeal to the eye! 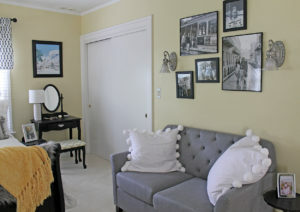 My favorite spot in the room has to be the new grey tufted loveseat…a great place to curl up and read a book! 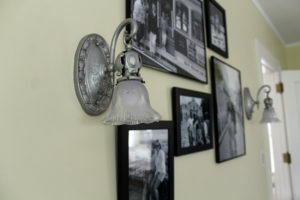 I updated the brass sconces on the wall behind the loveseat by painting them a matt nickel finish. 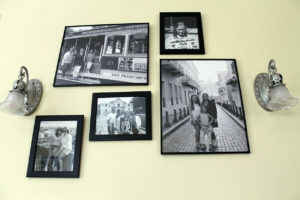 The new pictures on the wall are fun memories of recent family vacations. You know how when you move into a new house, you put together a list of things you want to improve or change? Well, this was on our short list of things to do over eight years ago. Yes, I said eight years ago AND we finally did it. 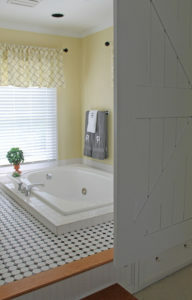 Here’s the issue…our bathroom is very open to the master bedroom. It bothered us at first, but then we just grew used to it…at times. At other times, I really wanted a bit of privacy. 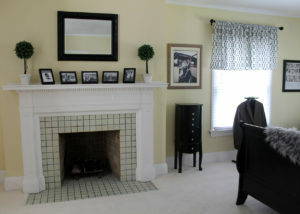 We finally came up with a solution of how to separate these two rooms, and I just love it! 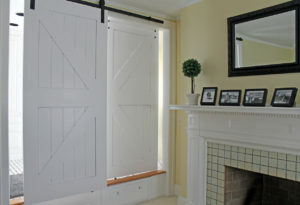 We had sliding farmhouse style doors installed between the two rooms. They function perfectly, and I love the crisp look of them! Now I can close the “door” while I take a shower. 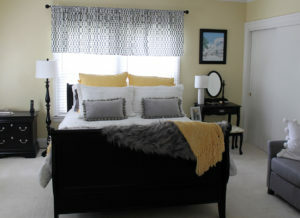 We didn’t do a total redo…but with these changes and updates, I feel like I’m living in a brand new room!